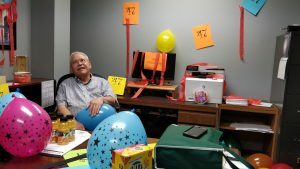 Congratulations to our Executive Director, Carl Rosenkranz, who celebrated his 47th anniversary with OACAC on Sept. 13! 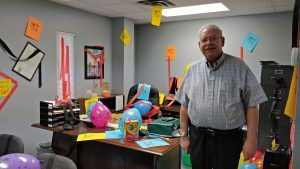 Carl, pictured below, was surprised by a decorated office, well wishes, and goodies. Carl started his career with OACAC in 1971 as a Field Service Representative. 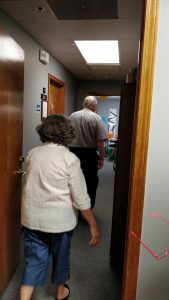 He held the positions of Adult Basic Education Coordinator and Neighborhood Centers Coordinator before starting as Executive Director in 1974. Here is a snapshot of what was going on in the world the year Carl came to work for OACAC: Intel released the world’s first microprocessor, National Public Radio (NPR) broadcasts for the first time, the voting age was lowered in the U.S. to 18, and the Walt Disney Resort opened in Florida. The average monthly rent was $150, gas was 40 cents per gallon, and you could see a movie in the theater for $1.50. While many things have changed over these 47 years, Carl’s dedication to people and community through his work in Community Action has not. Many thanks to Carl for his lifelong service to others.